In the early decades of the nineteenth century, the Great Lakes and their tributary waterways flowed through areas densely covered with virgin timber. This timber became a primary resource for both regional and national building materials, industry, and fuel. Timber harvesting began along the shores of the southern-most lakes - Ontario, Erie, and Michigan - during the first five decades of the nineteenth century as new cities were built at strategic locations. Eventually, the demand for lumber exhausted local supplies. By the 1840s, cities like Cleveland, Buffalo, Toronto, Milwaukee, Chicago, and Detroit were importing wood products both for local use and for transshipment to the east and west. This process was accelerated by the great Chicago fire of 1871 and the resulting need to rebuild one of America's leading cities. The result of the increasing need for wood products was a dramatic rise in the harvesting of timber resources. The area of harvest moved rapidly inland, away from watercourses, and further from the major cities the timber was meant to supply. As stocks were depleted in one area, the "timber barons" - the individuals who made millions by deforesting much of the midwestern U.S. and Canada - moved their operations to virgin, often remote areas. In this manner much of Michigan, Wisconsin, Minnesota, and Ontario were cut over by the end of the nineteenth century. The products of the lumber trade were quite diverse. 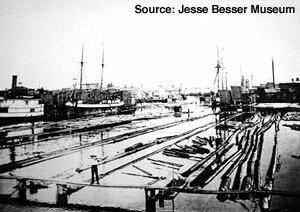 The most basic unit of trade was the rough-cut lumber that was harvested in the interior and shipped from or processed in lumber ports like Alpena, Bay City, Saginaw, Muskegon, Grand Haven, Manistee, Green Bay, and a number of points on Georgian Bay. This rough cut and processed lumber was then shipped via lake vessel to transshipment hubs like Toledo, Buffalo, and Chicago, where it was finished or forwarded to markets all over North America. Among the products created from the Great Lakes forests were shingles, tan bark, masts, telephone poles, railroad ties, slabs, posts, potash, cordwood, barrel staves, and paper pulp. Lumbering was Thunder Bay's first extensive local industry. 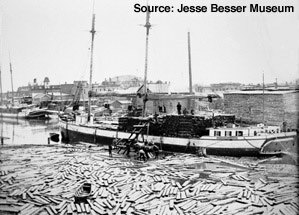 From 1836 through 1921, the Thunder Bay region was a major center of the lumber trade, shipping the products of local mills to markets all over the eastern U.S. and Canada aboard hundreds of sail, steam, and motor-driven craft. In addition, beginning in about 1845, Thunder Bay Island was a "wooding" or fueling station for steamers bound between Detroit and Mackinaw. The first sawmill at present-day Alpena was erected by Jonathan Birch in 1836 on the Thunder Bay River, but hostilities with Native Americans forced him to move to Sulphur Island for a time, before transferring is operation to Devils River. The first sustained lumbering operation in the Thunder Bay River area began in 1859, when Lockwood & Minor shipped a load of lumber from Alpena. Soon, other lumber mills entered operation, and production increased rapidly as the U.S. Civil War and growth in eastern and western cities created an enormous demand for lumber. By the late nineteenth century, there were at least a dozen large establishments producing lumber for export. Churchill lumber mill in Alpena at the turn of the 19th century. Timber for the mills was cut locally at first. As nearby supplies were depleted, the harvesting activities moved inland along the Thunder Bay River and its tributaries, which served as the primary means of transporting the cut timber. By the 1890s, timber in the region was exhausted, so additional timber was imported from Canada in huge rafts. Log sorting ponds at the mouth of the Thunder Bay River in 1894. Logs were collected, sorted, and fed to the respective sawmills by the Thunder Bay Rive Boom Company. The need for sorting and holding ponds and booms for logs led to the creation of dock systems along the Thunder Bay River and at the river mouth. Logs were cut into lumber, shingles, or lath, and stacked on the docks for shipment by boat to many Great Lakes cities. 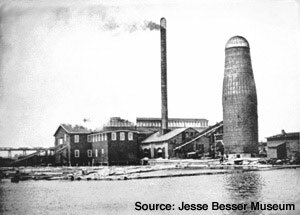 Alpena's era of lumber mills came to an end in 1921, when the F.W. Gilchrist mill closed its doors. Loading cedar in Alpena with a horsepower elevator in 1889. As a result of the lumber activities in the Thunder Bay region, a number of the vessels wrecked in the vicinity were lost while engaged in the lumber trade. These vessels include the schooners or schooner-barges JOHN F. WARNER (1890), JOHN T. JOHNSON (1904), and JAMES MOWATT (1919), and the former schooner turned motor vessel JAMES H. HALL (1916). The propeller GALENA (1872) was also lost while carrying lumber, as was the motor vessel O.E. PARKS (1929).